It’s that time of year again! My marathon Oscar® insanity has been going on for a couple of weeks… time completely got away from me! But the recipes are ready and now I only need to share with YOU before ummm… getting back to the kitchen to make them all again for SUNDAY! Whew. 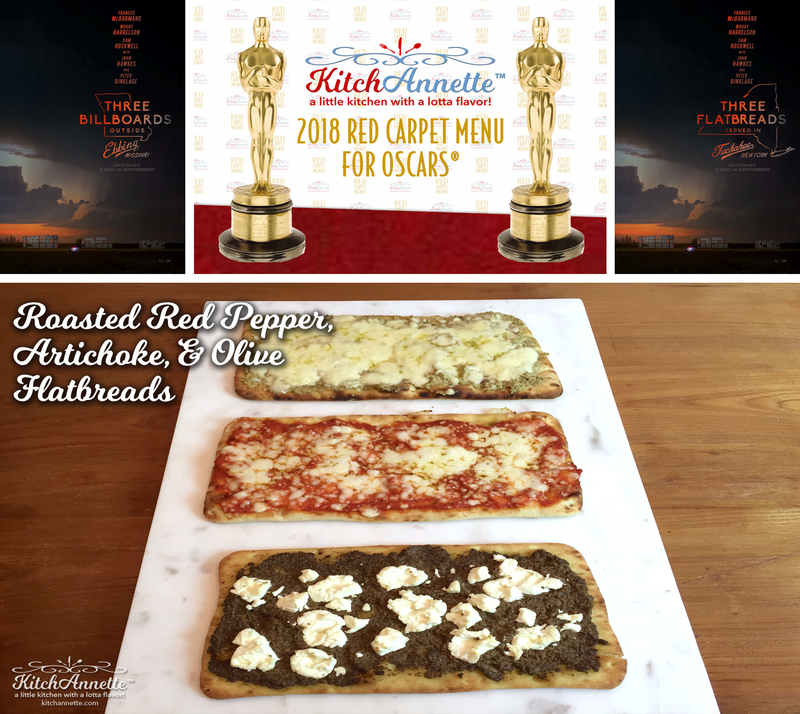 Well let’s get started with our first appetizer honoring Three Billboards Outside Ebbing, Missouri – it’s Three Flatbreads Served in Tuckahoe, New York! Three distinctive flavors that send a clear message of savory deliciousness. YEAH! When this movie first hit theaters, my friend Barbara DeBisschop saw it and called me immediately. She loved the movie and thought it was going to be nominated for sure. Then she said “it’s got to be THREE FLATBREADS!” Perfection! There was no way I wasn’t doing it. Hats off to Jennifer Savastano for coming up with the rest of the name. As I was losing my mind trying to figure it out, she very matter-of-factly suggested “Served in Tuckahoe, NY” since that is where I’d be serving them. Haha! That cracked me up and the name was set. 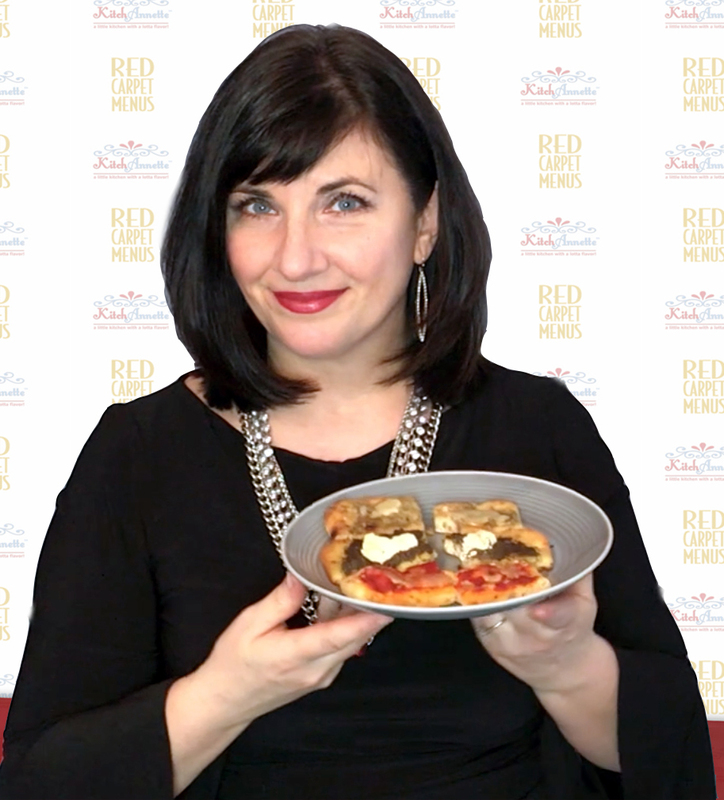 I was chatting about what these flatbreads would be with my friend Roberto Mazzotta, owner of an awesome pizza place in Pelham Bay, the Bronx called Joe’s Pizza, and he suggested roasted red pepper spread. Yes!!! I was going to be very literal about it all… red is the color of the billboards after all. And black olive tapenade was perfect to “write” with. Unfortunately I couldn’t spell out my message neatly so I was stumped. Leave it to a bunch of friends I had over last week to give me the perfect solution, which was so obvious in retrospect (as most things are) – create a third spread and add cheeses to complement each spread! YES! The next morning I knew artichoke spread would be a great addition (my favorite, it turns out) and the “drama” was over. You can certainly use spreads from a (gasp) jar BUT if you have 5 minutes and the simple ingredients, you can EASILY make them yourself, which is far superior. I put up the recipes in KitchAnnette 101 Kitchen Hacks . See below! Now let’s dish about the movie. Three Billboards… was really good. Such amazing performances. My predictions are Frances McDormand capturing “Best Actress”, Sam Rockwell grabbing the “Best Supporting Actor” award, and the film taking “Best Picture”. Now let’s move on to the next appetizer!! Liberally spread each flatbread with one of the three spreads. To the roasted red pepper spread, evenly distribute tmozzarella. To the black olive tapenade, generously sprinkle on goat cheese. To the artichoke spread, cover with fontina cheese. 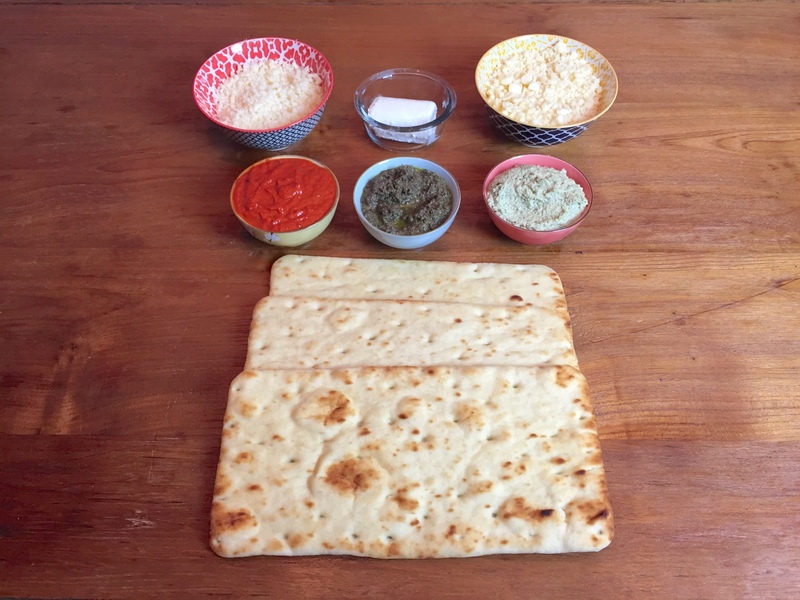 Place flatbreads on parchment-lined baking sheets and bake at 425° for 8-10 minutes or until the cheeses melts and the edges are golden. Serve immediately. Make the spreads from scratch EASILY! « Bacon Gruyère Sous Vide Eggs in 15 Minutes? YES!